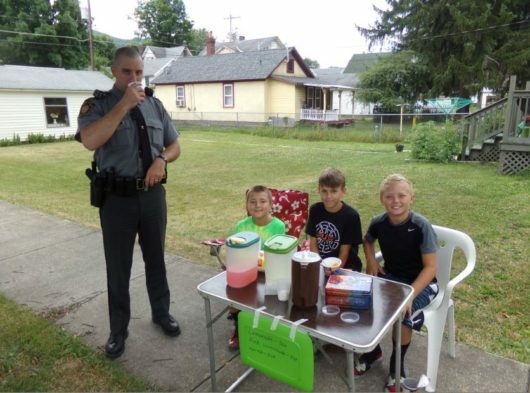 Pennsylvania State Police Trooper Joe Reiner stopped to purchase a refreshing beverage from a group of entrepreneurs on West Fifth Street this week. Woodland Elementary students Jake Narby, Brevin Lewis and Joshua Smith were operating the stand at the intersection with Poplar Street to raise a little spending money. Shown are the three boys and Reiner, who stayed and talked with the kids for a few minutes after making his purchase.